DeepMind’s feat is the most complex yet in a long train of contests in which computers have beaten top humans at games. Checkers fell in 1994, chess in 1997, and DeepMind’s earlier bot AlphaGo became the first to beat a champion at the board game Go in 2016. 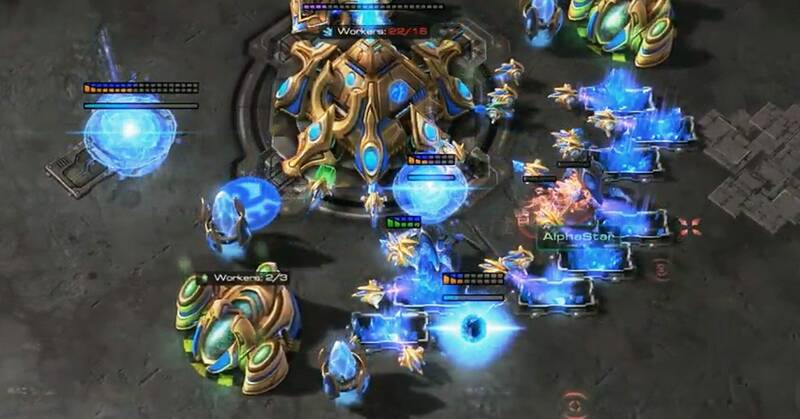 The StarCraft bot is the most powerful AI game player yet; it may also be the least unexpected. AlphaStar arrived roughly six years into an AI boom catalyzed by improvements in machine learning technology, including some from DeepMind researchers. While AlphaGo’s victory in 2016 was stunning—Go experts had thought the moment was at least a decade away—AlphaStar’s win feels more or less on schedule. By now it is clear that with enough data and computing power, machine learning can master complex, but specific, problems. StarCraft is a trickier challenge for computers than boardgames like chess because many more decisions are required to build and direct an alien army in real time. Videogames like StarCraft are mathematically more complex than chess or Go. The number of valid positions on a Go board is a 1 followed by 170 zeros, the equivalent for StarCraft is estimated to be a 1 with at least 270 zeros. Building and controlling military units in StarCraft requires players to select from and make many more actions, and to make decisions without being able to see an opponent’s every move. DeepMind overcame those steeper odds with help from the beefy TPU chips that Google invented to put more power behind machine learning. It adapted algorithms developed to process text to the task of figuring out what battlefield actions lead to victory. AlphaStar was schooled in StarCraft with records of half a million games between humans, then by playing successive improved copies of itself in a virtual league, in a form of digital evolution. The best bots that emerged from that league accumulated experience equivalent to around 200 years worth of gameplay. The AlphaStar that beat MaNa is far from being his all-round equal. For now, the bot can play as only one of the three alien races available in StarCraft. In addition to its inhumanly long gameplay experience, DeepMind’s software perceived the game differently. Its view encompassed everything visible in the game at once, while MaNa had to pan around the map to see what was happening. AlphaStar is also capable of greater precision when steering and aiming units than a human wielding a computer mouse, although its reaction time is slower than a pro gamer’s. Despite those caveats, Riedl and other experts watching Thursday generally cheered DeepMind’s work. “It was super impressive,” says Jie Tang, a researcher at independent AI research institute OpenAI working on bots that play Dota 2, the world’s most lucrative e-sport. Such videogame stunts can have potentially useful spinoffs, he says. Algorithms and code that OpenAI used to challenge Dota pros last year, with mixed success, were adapted to make robotic hands more nimble. All the same, AlphaStar illustrates a limitation of today’s highly specialized machine learning systems, says Julian Togelius, a professor at NYU and author of a recent book on games and AI. Unlike its human opponent, DeepMind’s new champion can’t play at full strength on different game maps, or as different alien races in the game, without extensive further training. Nor can it play chess, checkers, or earlier releases of StarCraft. That inability to handle even minor surprises is a challenge for many hoped-for applications of AI, such as autonomous driving or adaptable bots that researchers call artificial general intelligence, or AGI. “To get to the G in AGI we need to move beyond individual games,” Togelius says. A more momentous human-machine gaming battle might be a kind of decathlon, with board games, videogames, and a finale of Dungeons and Dragons. The limitations of highly specialized AI seemed to be on show when MaNa played a live exhibition game Thursday against an experimental version of AlphaStar that is limited to viewing the game map more like a human player, one zoomed-in area at a time. DeepMind’s data shows it is almost as good as the version that beat MaNa over five games. The newer bot quickly amassed an army powerful enough to crush its human rival, but MaNa used smart maneuvers and experience from his 5-0 drubbing to feint the forces into holding off. The delay bought him time to build up his own units—and win. “That adaptability is something we don’t quite see from machine learning systems yet,” says Tang.